On October 21 I will be 40. That used to seem so old- now I feel like I am just getting started. My friends and family will spoil me for my birthday but I want to do one of my favorite things and spoil you! I have been slowly collecting the toys that I thought would be some of the hottest items this year for the holidays under $20. I have amassed a nice collection to give away as we get closer to December 25th and life gets more stressful. I will be giving them away on a pretty regular basis in the A Frugal Chick Facebook Room and on the website! But I wanted to start with a BIG give away so here it is- one of each of the toys I think is going to be hot PLUS an LOL Surprise Glam Glitter. Check out my favorite toys for 2018 because you are going to have to pick your favorite below! The computer will pick a winner on 10/22 (my birthday is the 21st but I am hoping not to work too much!) I will e-mail them and they will have 24 hours to get back to me. If they don’t a new winner will be chosen! Happy Birthday !!! I would like the Pomsie. Happy belated birthday! I hope you had a blast!! My favorite is also the rescue runts. They are just so adorable! I like the Rescue Runt the best. Happy Birthday! Rescue Runts are my favorite. Hope your day was special, what a nice thing to do! My favorite are the Pomsies. I love the Rescue Runts! The Rescue Runts is my favorite! HAPPY BIRTHDAY!! The LOL dolls are so freaking cute. This is amazing. Would love to win for my daughter. Happy, happy 40th to you! I love the LOL balls! So much fun! My 4 year old son would say fingerling!! I like the Rescue Runts! Hope you have a wonderful birthday. Thank you so so much for all your hard work and time to help out others. I like the lol ball the best. I like the rescue runts. I like the Untamed Fingerlings. The Rescue Runts are adorable!! The Rescue Runts are so cute!! The pomsie is my fav! Pomsies or rescue runts would be a big hit in my house, so either would be great! I like the LOL balls best. Happy Birthday! Definitely the Pomsies! My granddaughter would love it! I love the rescue runts the most. Happy Birthday!!! The t-rex and rescue runts would be the sure winners in our house. I like the pomsies best. Happy birthday! I love yellies! My kids would love that but I think I’d have to keep that one! I have 3 young kids who would honestly love all of these, but my son is especially enamored with spiders, so the yellie would be a huge hit! Happy Birthday! I love the PomSies and Rescue Runts are so cute! I would love the yellies.. .. promises and cool too, but these yellies are gonna be hot! my kids friends families would love them.. Happy birthday, and thank you for the opportunity.. you do great things for all of us year round! Happy birthday, the rescue runts are so cute!! I’m loving the Rescue Runts and the concept of them! My Granddaughter would love a LOL doll. This looks amazing! Got a pomsie for my little already thanks to you! Happy bday ! My favorite of these is rescue runts ! So cute. Happy Birthday!!! My bday is tomorrow!!! My lil kiddo would love and appreciate any of these awesome toys! Thanks for what you do! Promises! I need at least 2 for my girls! S would love the Pomsie, and R&W would especially like the t-Rex lol. All the toys would go to good use for sure 🙂 HAPPY BIRTHDAY!!! Those rescue runts will probably be a big hit!! I am sure my daughter will ask for one lol. Such a great thing you’re doing for your birthday I hope it’s a good one!! I’d love the rescue runt for my pet crazy niece! The rescue runts are amazing. Happy Birthday! Love Rescue Runts, L.O.L. AND Yellies. Also Krispy Kreme and PaPa John’s. Happy early birthday! Thanks for a great give away! This is sooooo wonderful of you ! Hope you have a fantastic 40th Birthday you deserve it !! Rescue runts, Yellies and Lol surprise (always a fav around here!) are what I’m currently hoping to grab for the girls! My favorite is the rescue runt. Love the rescue runts and Yellies!! The Pomsies are my favorite ,so cute! Happy upcoming 40th! I had mine a couple of months ago! Hppy Birthday! Promises are wonderful! I like the Rescue Runts. They are so cute. My special needs son would love to have all of that stuff! Please pick me, our budget is super tight. He loves animals, the Yellies, Pomsies, and Rescue Runts are right up his alley. My girls would LOVE these! Thanks for the chance to win! This giveaway is amazing! Happy Birthday!!! I love the resume runts! Happy birthday!!! We love the untamed fingerling they are so much fun!!! I personally like the Rescue Runts but think the Yellies would be fun to race if you had more than one. Happy 40th birthday ! I like the Yellie’s. From one birthday chick to another, Happy Birthday! And since my family is very loud, YELLIES! We don’t have much for Christmas this year. Only kids are getting things and only a little. This would be a blessing! I couldn’t figure out how to enter? Hopefully this is how. Pomsies and the Dino fingerlings! I love all of the Pomsies! Happy birthday from someone who shares your birthday month! I love the rescue runts. Happy birthday! Ah, I’m so torn between the rescue runts and the yellies, they are both so cute! Happy Birthday! I’m excited about the Pomsies they are so cute! Happiest birthday to you! Rescue Runts all the way! Happy Birthday!!! The Rescue Runts are adorable! Happy birthday! What fun way to celebrate! IDK what yellies are but I’m interested! My girls would love the rescue runts or yellows. Great opportunity! Thanks so much ! Happy Birthday ! Rescue runts and pomsies. My birthday is the 21st as well! Happy birthday! Rescue Runts look like something my daughter would love! I would love to win and then give it forward to kids in my apartment building. Thanks for everything u do. 40 and frugal! 🙂 wishing you the happiest birthday ! Happy Birthday! Thank you for sharing all your finds with us. Think we may have to do the Yellies this year! Wow, we’re close to the same age! (I’ve been 40 a few months!) Happy birthday!! I think the Pomsies are so cute! Rescue runts are too cute!!! What fun! Thanks for sharing. My daughter is LOL obsessed and they can be hard to find. Happy early birthday, Laura! 40 is the New 25. Enjoy! This is crazy!! Happy 40th!! it’s the Rescue Runts for me ! 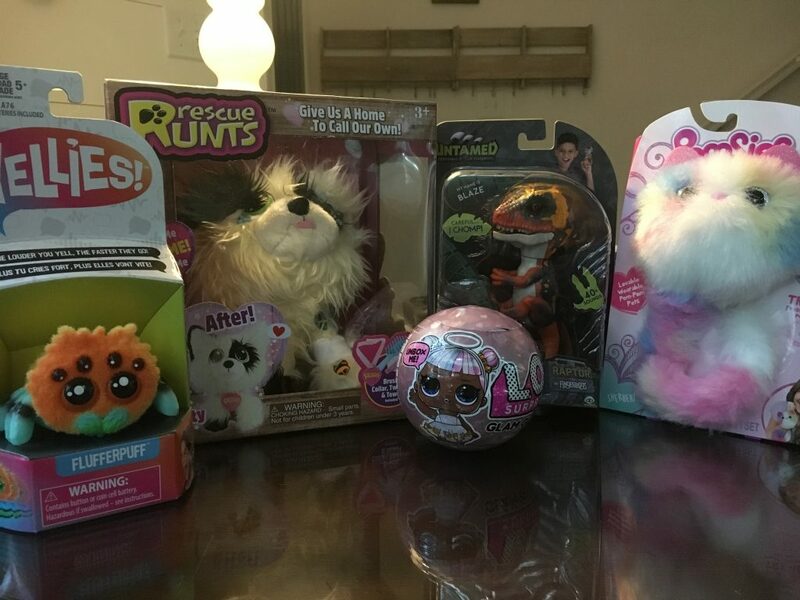 Oh I love the rescue runts…..and my granddaughter loves anything LOL of course. 🙂 Thanks for the chance and Happy happy Birthday! 40 isn’t so bad. I absolutely adore the rescue runts, they are so cute! The Rescue Runt is too cute. The Rescue Runts are adorable. I’m sure that is going to be on my son’s Christmas list. Love the Pomsie or the rescue runt!! I also like the Rescue Runts. Its exactly the type of thing my daughter would like. Rescue Runts are my favorite! My daughter would love the Pomsies! Cute toys! Love the new legos! I like the Raptor Fingerling! My 5 year old is CRAZY for these LOL dolls! I have yet to buy one because they are SO pricey!! Fingers crossed I can win her one!